In May 2010 India based Reliance Entertainment bought a majority share of the sales outfit IM Global and the first full collaboration between the two companies was Dredd. IM Global took the reboot of the comic book character (and the toxic 1995 Judge Dredd Stallone stinker) to the Toronto International Film Festival in 2010 for pre-sales. The $45 million budgeted Dredd was the best seller to distributors at the festival and landed more than $30 million from the pre-sales — including $7 million from UK based distributor Entertainment. Lionsgate brokered a three picture deal in November 2010 with IM Global and Dredd was one of the projects the mini-studio would distribute stateside, with their P&A spend backstopped by Reliance — if the movie tanked. Along with the stench of the previous Judge Dredd movie looming over this property, buzz was off to a negative start in late 2011, when word got out that director Pete Travis was removed from the editing room. Screenwriter Alex Garland took over the editing process and the director and writer issued a joint statement saying this was an “unorthodox collaboration” — which sounds exactly like what a non-disparagement clause in your contract would force you to say. Actor Karl Urban has since said that he took direction on set from Garland, who was the real director. 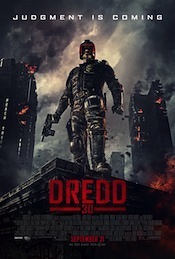 Dredd premiered two months early at Comic-Con and despite all the production woes, it was greeted very enthusiastically. Lionsgate dated Dredd for September 21 and spent a reported $25 million on P&A. It bowed against End Of Watch, House At The End Of The Street, Trouble With The Curve and the nation wide expansion of The Master. The marketing for Dredd was terrible and despite decent reviews and a salivating fan base, the marketing never attracted audiences outside of the geek comic book fanbase. When promotional ads stress that this time Judge Dredd never takes off his helmet, you are only going after the already initiated and likely turned off most of the moviegoing public. Tracking was soft going into release and it was only expected to pull in $8 – $10 million for the weekend. Dredd was dead on arrival with $6,278,491 — placing #6 over the very slow weekend led by End Of Watch. Even with the awful opening, Dredd was front-loaded and sank 62.3% the following frame to $2,363,956. It lasted just six weeks in theaters and ended its US run with only $13,414,714. Lionsgate would see returned about $7.3 million after theaters take their percentage of the gross, leaving most of the $25+ million marketing spend in the red. Karl Urban, Lena Headey and Olivia Thirlby are the three main leads of “Dredd”. They were (and still are) actors that you probably recognize from other movies (ie. Urban is Dr. McCoy in the Star Trek reboot and Headey is in “300”) but they’re not household names. They’re B-list movie stars, at best. So while they each put in good enough performance in the movie itself they were booked for few, if any, appearances at venues like The Tonight Show, Late Show or Good Morning America to really “Dredd”. What’s not clear is if the distributors tried to get them bookings or did not even bother and just wasted the marketing dollars.